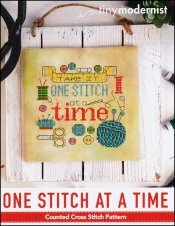 One Stitch At A Time [W1105] - $7.00 : Yarn Tree, Your wholesale source for cross stitch supplies. Cross stitch pattern from Tiny Modernist. Look at this bright & adorable design to stitch for all of your stitching friends! This design features the saying, "Take it one stitch at a time," stitched down the center of the design. A needle & thread, scissors, buttons, pincushion, etc. are stitched around the saying. Stitch count 67w x 67h.